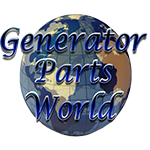 This is for 1 to 5 GreenCut generator carbon brush assemblies. This carbon brush is a universal type part that is used in brush type generator heads. This brush has 2 carbon sticks and 2 spade terminals, a positive and a negative. If your generator has no output this part is one of the most common issues. This style of carbon brush will work as a replacement for any carbon brush that it resembles. The carbon brush can be seen in the end of the generator head. The 2 single wires on the AVR connect to the positive and negative spades on the brush. To locate the brush simply remove the cover off the end of the generator head. The carbon brush will be connected to the wires on the AVR. Once located, make sure that your carbon brush is making contact. Also make sure the wires are attached properly. The carbon brush has 2 – 1/4″ diameter holes for mounting and they are spaced on 1″ centers. The first brush is roughly 5/8″ from the backside of the brush. The carbon sticks are spaced on 5/8″ centers. If needed you can use spacers to allow the brushes to make contact. This carbon brush will ship for FREE from our US warehouse. Your order will ship next business day with tracking uploaded to PayPal. Your package will ship with USPS with a delivery time of 3 to 5 days from cleared payment! Looking for better Wholesale bulk pricing? Click the link below to view our wholesale lot pricing! Want to buy this item on eBay? Just click below to view our item on eBay!